Just when we thought it was impossible to gush any harder over NASA’s wonderful Juno spacecraft, this gorgeous fly-by video of Jupiter surfaced, and the incredible footage has hit us right in the cosmic feels. 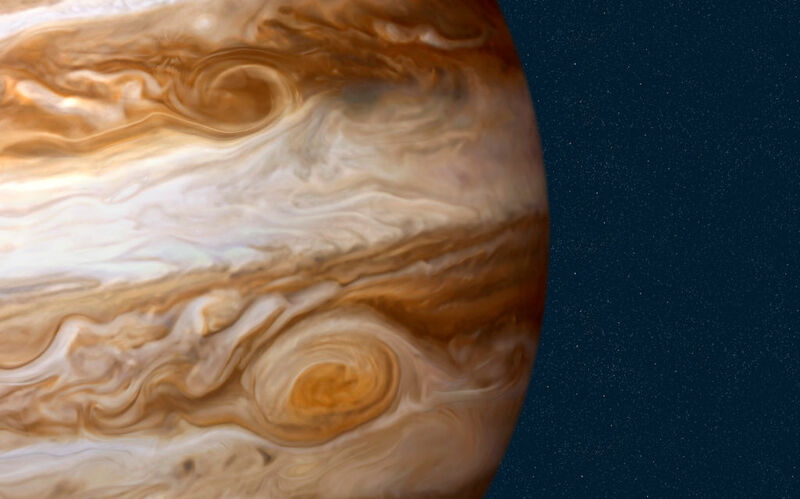 While we were back on Earth absolutely gagging over these dreamy photos of Jupiter’s marble cloud-filled surface, Juno was completing yet another one of its orbits around the distant, giant gas planet. In case you’re just getting hip to this marvelous ongoing space adventure, every 53 days, Juno voyages near Jupiter’s surface. After flying close by the planet’s north and south poles, the spacecraft transmits raw photos of its respective trips back to Earth. A little more than two weeks ago, Juno completed its fifth pass of Jupiter, and needless to say, the images were absolutely stunning. Further satiating our galactic curiosity, mathematician Gerald Eichstädt has teamed up with animator Seán Doran and Avi Solomon to turn JUNOcam images into a video that shows us what it would be like to join the spacecraft on one of its two-hour polar explorations. According to Wired, it took Eichstädt 60 hours to combine 36 images that he colorized into video using a software he wrote. Using Juno’s trajectory data, he was able to pinpoint precisely where the spacecraft was when it snapped each image. After he uploaded the clip to unmannedspaceflight.com, Doran enhanced each of the film’s 2,400 frames, and with the addition of a sci-fi soundtrack, the awe-inspiring mini-motion picture was complete. SIGHS. And just like that, our space obsession just intensified. We can’t wait to see what creativity comes of Juno’s next close flyby of Jupiter. It takes place on July 11th, 2017 when the spacecraft will fly over Jupiter’s famous Great Red Spot.